This fast and easy recipe is perfect for any type of barbecue! In a bowl, stir 2 tablespoons of the horseradish with the lemon juice, Worcestershire, celery seeds and 1/2 teaspoon of black pepper. Whisk in 1/4 cup of the canola oil in a steady stream; season with salt. Add the tomatoes and celery ribs and leaves, season with salt and pepper and toss. In a small bowl, stir the sour cream with the remaining 2 tablespoons of horseradish. Light a grill or preheat a grill pan. Rub the remaining 2 tablespoons of canola oil all over the steak and season with salt and black pepper. Grill the steak over moderately high heat, turning once, until nicely charred, 3 to 4 minutes per side for medium-rare. Transfer the steak to a work surface and let rest for 5 minutes. 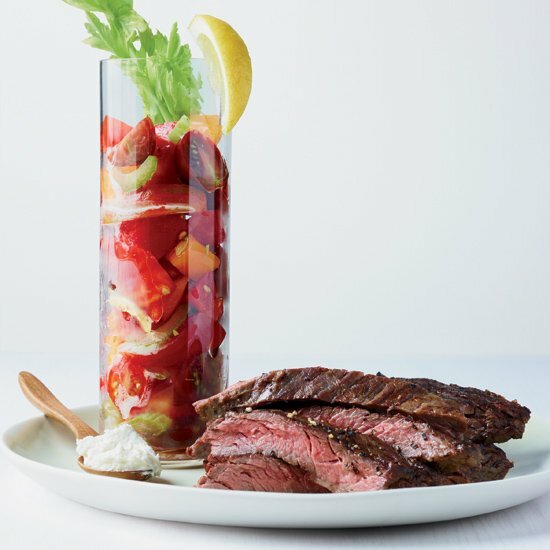 Slice the steak across the grain and serve with the tomato salad and horseradish cream.